A strong association has been observed between “both the earlier onset and more serious degree of dementia even with milder hearing loss, but especially with very severe hearing loss.” The primary study, done by Frank Lin of Johns Hopkins University, looked at nearly 2,000 adults age 75-64 over a 6 year period. The study, published by the Journal of American Medical Association in January 2013, found that senior citizens with hearing problems were 24 percent more likely to develop mental decline. On average, researchers believed that people with hearing impairment would take 7.7 years to develop mental impairment, whereas people with normal hearing would take 10.9 years. 1. Isolation – people with hearing loss tend to isolate themselves and isolation is a risk factor for dementia (whether you’re hearing or hearing-impaired). 2. Cognitive load – or overload. When you can’t hear well (even with corrected hearing), trying to hear someone speak makes it difficult to absorb the information of what they are saying. 3. An unknown underlying pathological mechanism that has an influence on both hearing loss and dementia, either environmental or genetic. Lin says, “it could…be that if you’re constantly having to expend more (mental) energy decoding what you hear, then it comes at a cost…Hearing loss doesn’t directly contribute to dementia, but leads to cognitive load on the brain.” Lin’s study also found that hearing aids were “not significantly associated with lower risk” for cognitive impairment. 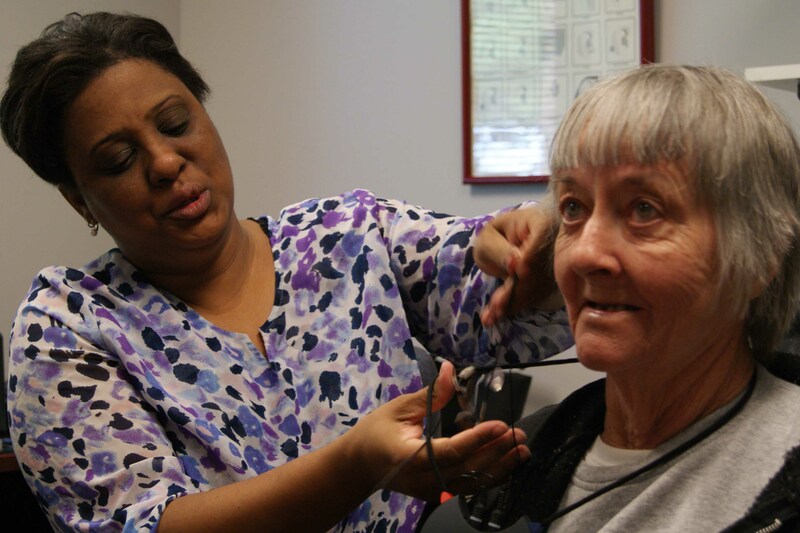 Lin noted that self-reporting of hearing-aid use is unreliable and further study is necessary. What does all this mean? Well, no one knows just quite yet. No causal relationship has been identified (one disease does not cause the other), and it is not known if the link is hereditary or environmental. What researchers do know, however, is that maintaining an overall healthy lifestyle decreases patients’ risks of all types of diseases. The final word is to protect your hearing. Wear ear plugs, get your hearing tested, get it corrected, and enjoy a longer cognitively active life. Lloyd, Janice, “Listen up: Dementia linked to hearing loss,” http://www.usatoday.com/story/news/nation/2013/01/21/dementia-hearing-loss-elderly/1842919/ (5 March 2013). Belluck, Pam, “Could Hearing Loss and Dementia be Connected?” NYTimes online: http://www.nytimes.com/2013/02/12/science/could-hearing-loss-and-dementia-be-connected.html?pagewanted=all&_r=0 (5 March 2013). Castillo, Michelle, “Hearing loss may be linked to dementia,” http://www.cbsnews.com/8301-204_162-57565235/hearing-loss-may-be-linked-to-dementia/ (5 March 2013).